Beat together the sugar, vanilla and eggs until pale and creamy. Sift the flours and cocoa over the egg mixture, fold into the egg. Gradually add the cooled melted butter, whilst folding the mixture with a spatula. Pour the mixture into a lightly greased Weber Q Ware Large Casserole Dish. Once the barbecue has preheated, adjust the burner(s) to the baking setting. Place the sponge cake on with the casserole lid off and cook for 35 to 40 minutes, or until a skewer inserted into the middle comes out clean. Turn the cake out onto a wire rack to cool completely. Whilst the cake is cooling, make the cherry filling. Drain the Morello cherries, reserving 1/2 cup of Morello cherry liquid. Place the Morello cherries, cherry liquid and glace cherries to a clean Weber Q Large Casserole Dish and place over direct medium heat and bring to the boil for 5 minutes. Using a plastic spoon, place approximately 2 tablespoons of the hot cherry liquid into a small bowl and mix with the arrowroot to dissolve, add the arrowroot mixture back to the casserole dish. Continue to heat the cherries for a further two minutes or until thickened. Leave to cool. Once the chocolate sponge has cooled, slice in half lengthways. 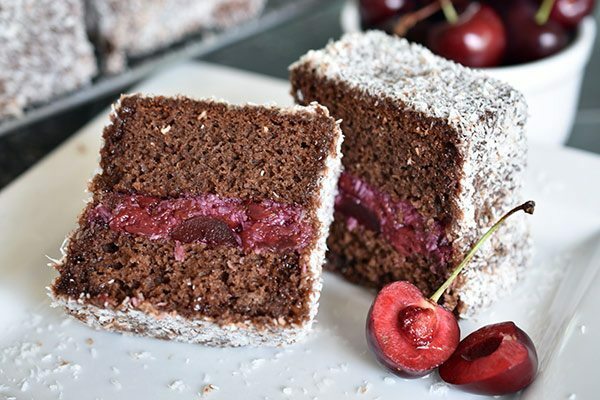 Spoon the cherry mixture onto the cut side of the cake and sandwich with the other half of sponge. Cut into 15 squares and place into the freezer for at least 30 minutes while making ganache, this will make it easier to dip the cake into the chocolate ganache. To make the chocolate ganache; break up the chocolate into a heat proof bowl. In a Large Weber Q Casserole Dish, bring the cream to the boil over medium heat. Pour the hot cream over the chocolate and let stand for 2 minutes. After 2 minutes, stir gently to combine. Pour the desiccated coconut into a large bowl. Dip the lamington squares into the chocolate ganache using two forks. Finish by rolling the lamingtons in desiccated coconut.